The fellow with the polka-dot tie, the striped suit and the brown derbythe one you can't look at without humming the "Sidewalks of New York"took a look at San Francisco today for the first time in 19 years. 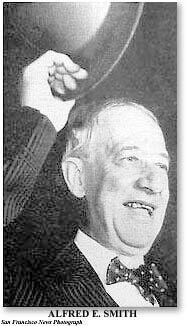 In case you can't guess, he's Alfred Emanuel Smith, never seen without a cigar, the fellow who might have been President in 1928 if Herbert Hoover hadn't polled so many votes. He arrived in San Francisco last night at the Southern Pacific depot with his wife and Mr. and Mrs. Orrie Kelly. Mr. Kelly is president of the Lawyers Trust Company Bank, of which Al is a director. The party went to the St. Francis Hotel, where Mr. Smith said all he intends to say while vacationing in San Francisconothing. Today they are touring the Bay Area. Tomorrow will be "Al Smith Day" at the Exposition, starting with a reception at the City Hall at 11 a.m. At 12:30 p.m. Al Smith will talk at the Open Air Theater on Treasure Island. After a private lunch he will tour the island, then receive friends at 4 p.m. at the San Francisco Building.